Heat oven to 300&deg;F (150&deg;C). Line one 9x5-inch (2 L) loaf pan or two 8x4-inch (1.5 L) loaf pans with parchment paper. Allow paper to hang over edges slightly for easy pan removal after baking. In large bowl, combine cake mix, softened butter and eggs; beat according to package directions. Using a wooden spoon, gently fold in apricots, pitted dates, nuts, candied pineapple and cherries until fruit is evenly coated with batter. Spoon batter into prepared pan(s), distributing evenly. Bake for 1 hour and 45 minutes if using 9x5-inch (2 L) or 1 hour and 15 minutes if using two 8x4-inch (1.5 L) loaf pans, or until a toothpick inserted in centre comes out clean. If necessary, cover with foil during last 30 minutes of baking to prevent excessive browning. Remove fruitcake from pan (with parchment paper) to cooling rack. For a glossy top, immediately brush with corn syrup. Allow to cool completely and to become firm before cutting (about 24 hours). Wrap tightly and store in refrigerator no longer than 2 months. Easy Glaze: In small glass bowl or measuring cup, stir together frosting and extract. Microwave on medium power for 30 to 45 seconds or until it is a good consistency for drizzling. Using a spoon, drizzle evenly over the cooled fruitcake(s). Tip: Enjoy chocolate-coated fruitcake drops! 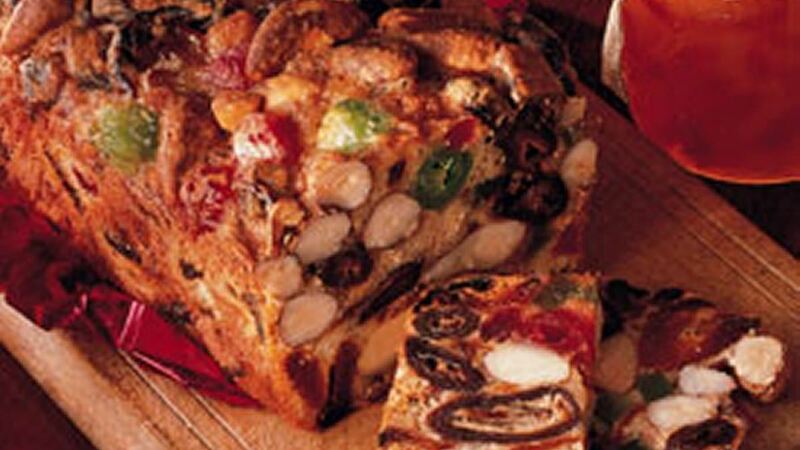 Cut leftover fruitcake into 1-inch (2.5 cm) cubes. Spear each cube with a toothpick and dip into melted chocolate. Set fruitcake cubes on waxed paper to harden.